I snagged a cheap 87V off Ebay. The meter is perfect, except the screen is pretty scratched and scuffed up. A combination of deep scratches and scuffs mar the screen. I started using the polish by hand, but it had very little effect. I moved on to a dremel and a polishing wheel. I was careful to keep the screen wet with lubricant and to reapply the polish to the wheel and to the screen. IMPORTANT! Early on in the process, I pressed the wheel into the screen while there was no lubricant. This left a nasty mark on the screen. My final technique was to hold the dremel by the end and let its own weight apply the pressure. Here is the finished screen, with all of the scuffs buffed out. Many of the deeper scratches remain. For a full restoration, I think I would need to be more aggressive and sand it with multiple grits before doing the final polish. I believe ModemHead has done this before with success. I've polished a few and have had to wet sand some of them. I read over your posts in that thread, but just to make sure, did you do 1000 then 2000 then polish? I read over your posts in that thread, but just to make sure, did you do 2000 then 1000 then polish? Isn't 2000 finer than 1000? And what about 4000? One thing I found very quickly is that plastic is very sensitive to aggressive polishing. Unless you have a super light touch, you can quickly add to the damage rather than reducing it. Yep. I just don't know how to type. It goes from 1,500 to 12,000 I also have some more reasonable grits laying around. Is there something else you would recommend? My first foray into polishing plastic was not at all successful. Fortunately it was not something that mattered. But since then, I am rather scared to try with anything valuable in case I destroy it. I am trying to figure out where to get something to practice on, made of the same kind of plastic as a typical LCD display, but something disposable. Just buy a nice little Aneng AN8008 and scratch it up? Sounds like a free Harbor Freight meter is just the ticket. It really depends on how deep the scratches have been. Just sand them using plenty of water. I have never tried using a dremel for this and would be concerned about damaging the plastic or creating waves in the surface. if it is polycarbonate AND you can dismount it, the easiest though destructive if you are to agressive is cleaning and VERY gently torching it from far away with a gaz torch, never staying at the same place or it will bubble definitely, if done well it will erase ALL scratches and make it clear as glass. I use 1) fine grit sandpaper then 2) paint polish. After wet rubbing I found rubbing with normal whitening toothpaste and then normal household polish works a treat. It's almost certainly polycarbonate, the same stuff CDs are made of. Old CD-Rs or other junk CDs make good practice material. I typically use Novus plastic polishes but there are other similar products. A Dremel type tool is dangerous, too easy to spin it way too fast and melt the plastic. Something slower like a cordless drill is preferable. And when you're all done, you can get some smartphone screen protector sheets to preserve your hard work. There is a product sold on EBay and Amazon called Polywatch and it’s designed for polishing the face of watches such as Rolex Submariners that have the older acrylic face. It is not expensive and it gives a perfect finish. 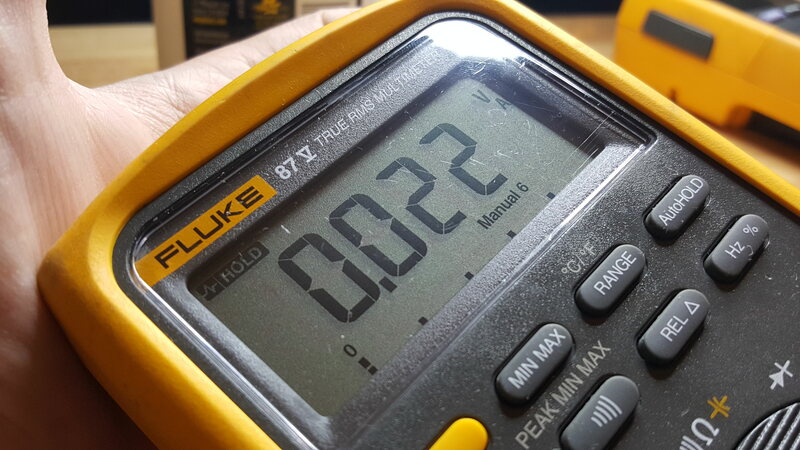 I cleaned up the screen of my Keysight meter with it to an mirror shine. Once you get the deep scratches out Polywatch will do the rest. 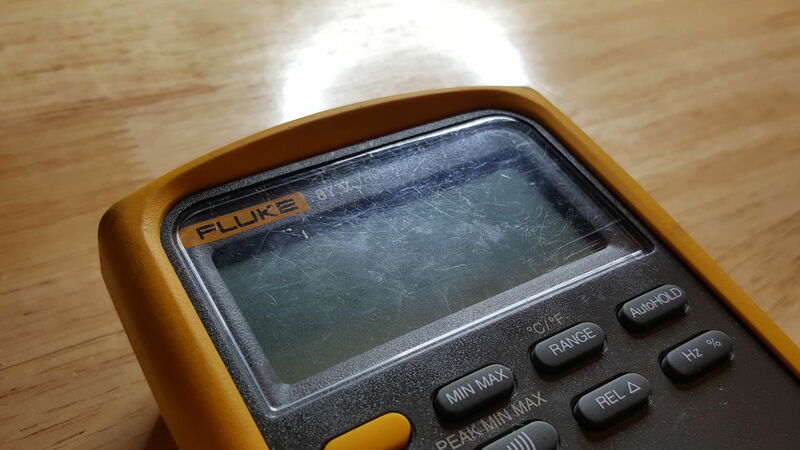 I used "Novus" to make scratches of my K2000 display unvisible. If you can get it out, why not replace it with a fresh piece of polycarbonate? 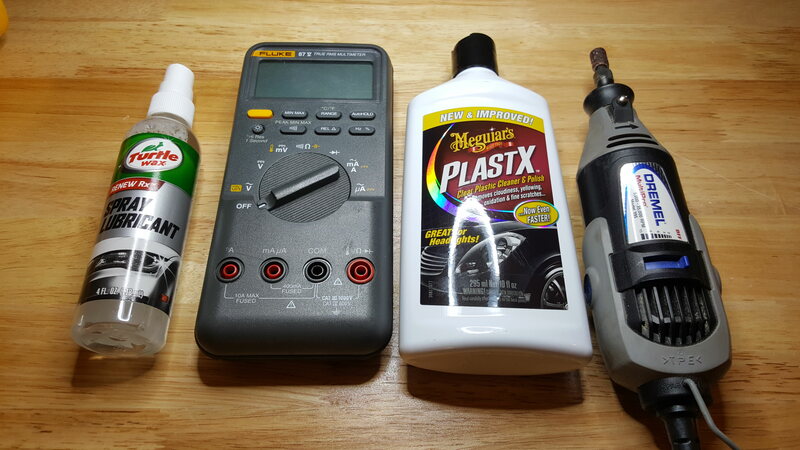 If anyone else is looking into polishing up test equipment clear plastic covers - look into the kits available for 'restoring' plastic car headlights. They are really cheap on amazon and likely less than getting sandpaper and polish separately. I've used the 3M kit on headlights and it worked well - just mask really well if you are using power tools! toothpaste on an old cotton tee shirt. hand force only, no machines.